Information: Stenacho is Classic Greek for sigh, groan, or wail. 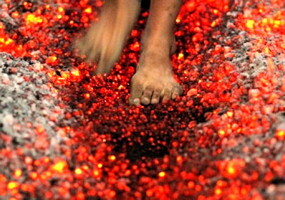 Anastanaszo (fire walker) comes from that root. The Bulgarian Nestinarstvo comes from the koine Greek terms in Old Church Slavonic. The festival includes the rescue of icons from the Church of Saint Constantine in the city of Kosti, East Rumelia (Bulgaria) in 1250. A three year old ungelded bull and a black goat each have a wreath placed around its neck and candles attached to its horns and are led to the altar upon which are the icons. The crowd is blessed with holy water, the animals slaughtered and divided among the participants, and the dancers are led to the coal dance floor by elderly women carrying candles and holding the icons, accompanied by tabor and reed pipes, while the Anastenaridaes walk holding handkerchiefs (sort of red sashes) between them as they first circle then ecstatically go into the flaming coals, groaning and sighing. These people, Greeks, migrated to Agia Eleni during the population exchanges of the 20th century. In Bulgaria, primarily in Strandža (Southeast Bulgaria) and in tourist cafés. 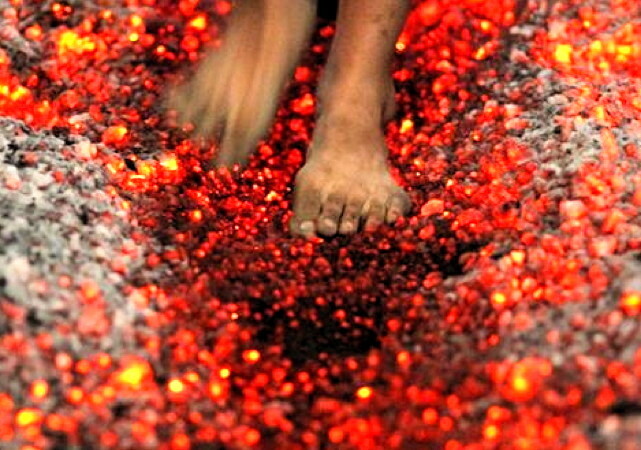 Nestinarstvo (noun), ritual dancing on coals. Nestinar (m), a male participant. Nestinarka (f), a female participant. In Greece, notably in Agia Eleni, near Serres. The festival of Anastenaria (from anastanaszo, to sigh or groan) on the day of Saints Constantine and Helen (May 21-3). A dance of self hypnotic preparation with ritual floggings, wine drinking, saturnalias, role reversals, waving of pine torches and so on to commemorate the saving of two icons from flames in Langadas. Ackerman, Robin. Anastenaria article in Quo Vadimus, 1980. Angelova, Rositsa. Igra Po Ogun, Nestinarstvo. Sofia: BAN, 1955. Crossland, John, and Diana Constance. Macedonian Greece. New York: Norton, 1982, 144-147. Haramis, Peter. Anastenaria film, available for rent from UC Berkeley media library. Kakouri, Katerina J. Dionysika, Modern Relics of Ancient Greece. Athens: G.C. Eleftheroudakis, 1963. Describes Anastenaria and Kalogeros. Katsarova, Raina. Documentary film. Sofia: Institute of Music, 1966. Manus, Willard. Anastenaria articles, in Laographia, mid-1990s.